So we did a recent post on Olympians who have made more than one appearance at the Olympics. One of the replies we got back was that it would be interesting to know more about this as it relates to the best known summer Olympic sport – athletics (track & field). So here we go. So who has competed in the most Olympic track & field athletics events? This gets a little complicated. Prior to 1928 there were a number of events no longer on the Olympic Program – standing jumps, odd walk distances, both hands throws, freestyle javelin, cross-country, various team races, and so on. In addition, we count the 1906 Olympic Games, which the IOC does not (they should). Here is the list of who has competed in the most athletics events, counting all events on the Program. 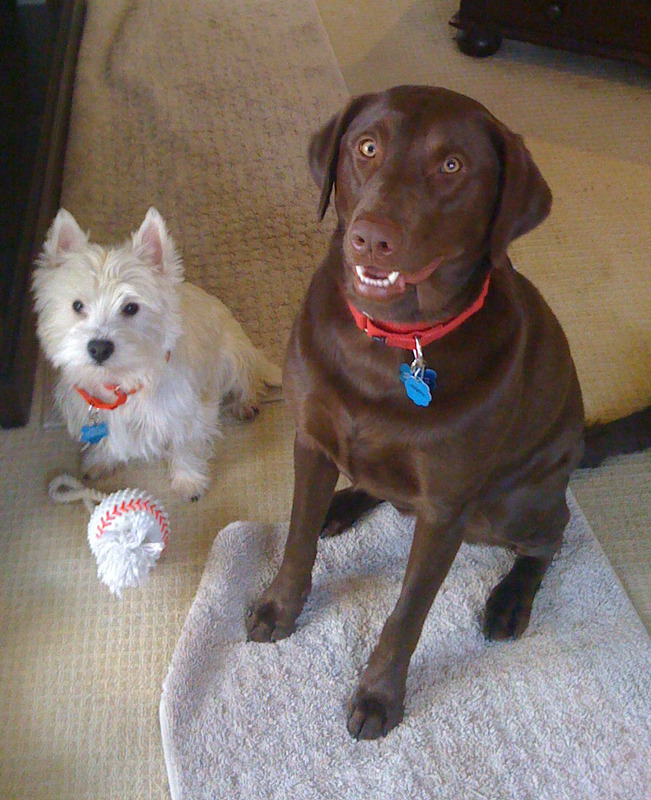 The column on the left does not include 1906, while the second column in includes 1906, which brings in Martin Sheridan, who would be #3 if 1906 is included (I am required to mention Sheridan by my Chocolate Lab, Marty, whose full name is Martin Sheridan Mallon). As you can see, and will see even further, Merlene Ottey and Eric Lemming are the queen and king of track & field appearances. Ottey leads this list, but Lemming would be #1 if we count 1906, at which Games he started in 8 events. So the question that started this was how many Olympians compete in more than 1 Olympics? The blog reader wanted to know many track & field Olympians compete in more than 1 event? Here is that table, and here we do include 1906 and all events. Its evident that most athletics Olympians compete in only a single event, and over 92% compete in 3 or fewer events. Now Merlene Ottey competed in 19 events but she competed in a lot of relays, 7 in all. What happens if we only look at athletics Olympians competing in individual events? Again we have 2 columns, one not including 1906, and the second column including 1906, which adds Sheridan (sorry, its required), Ray Ewry, Meyer Prinstein, and Lawson Robertson. Note that Lemming’s figures do not change – he competed only in individual events. And here is the breakdown of track & field Olympians by number of individual events in which they have competed – again including 1906 and all events. As you can see, when looking only at individual events, by far most athletes compete in only a single Olympic track & field event. So who has competed in the most track & field events at a single Olympics? Once again, we have the problem of the many older, unusual events, we have the problem of 1906, and we have the problem of individual or team events. Here is the list of the most events at a single Olympics, counting only modern events, and counting only individual events. And again Eric Lemming tops the list. This includes all those competing in 4 or more individual events at a single Olympics, and only 3 of them are women. Here is the list if we include all track & field events that have ever been on the Olympic Program. A familiar face leads the list, but you will note that the top 4, who competed in 8 and 7 events, all did so in 1906. Sheridan actually entered 15 events in 1906, but got injured in the pentathlon and withdrew from a number of them. So this is probably the list you’re looking for – most events at a single Olympics, counting only modern events, but including individual events and relays. Lemming is at the top with 6 in 1900, with 8 men who competed in 5 events in various years (none 1906), and Marion Jones in 2000 was the only woman to ever compete in 5 track & field events at a single Olympics. Or did she really compete? Maybe she has been erased – see the movie “Eraser” with Arnold Schwarzenegger, Vanessa Williams, and James Caan. Now a number of Olympians have competed in 2 or more track & field events at 2 or more Olympics. But only 8 Olympians have competed in 3 or more track & field events at 3 or more Olympics, with 2 of them dropping off the list if you are a 1906 stickler. There are 4 men and 4 women, with Merlene Ottey having done this a remarkable 5 times. Eric Lemming is also on this list, but that includes 1906. Now yesterday Galen Rupp qualified for the 2016 US Olympic marathon team, and is talking of also running the 10,000 in Rio. Remember 1952, when Emil Zátopek won the 5,000, 10,000, and marathon? (I don’t remember it too well – I was 5-months-old) Has that ever been done before or since? In London the doyen of Olympic beat writers Phil Hersh asked me to dig up some data about how common is it now for athletes to compete in multiple related events, such as the Zátopek triple. So we looked at a few of those. As anyone ever competed in the 100, 200, and 400 at a single Olympics. Yes, in fact, it has been done 36 times, by 32 men and 4 women. You never heard of any of them. The last to do it were females Zoila Stewart (CRC) and Ngozi Mwanamwambwa (ZAM) in 1992. The last man to do it was Daniel André, a Mauritian, in 1984. What about running the 200, 400, and 800? This is much rarer and has only been done 4 times, by 3 men, the last of whom did it in 1924. Again, you don’t know any of the men. The woman was Eugenia Osho-Williams of Sierra Leone who in 1980 achieved the remarkable feat of running the 100, 200, 400, and 800, figuring on both these first two lists, and is the only one to do this quadruple. She did not get past the first round of any event. What about the 400, 800, 1500 triple? Been done 7 times, 6 from 1904-12, with Israeli Mark Handelsman doing this in 1980. Nobody has ever run the 800, 1500, and 5K at one Olympics. But in the 1500, 5K, and 10K triple, we have 5 names, 2 of whom you should know. Sweden’s Edwin Wide did this in 1924, and Kenyan Kip Keino did it in 1968. The last time it happened was in 1968, when Keino was joined by Nepali Hari Bahadur Rokaya – some of these are pretty obscure. How about the Zátopek triple of 5K, 10K, and marathon? This has been done 17 times, and there are some pretty famous names in this group. Besides Zátopek, Lasse Virtanen (FIN) did it in 1932, and his countryman, Lasse Virén, did it in 1976, winning the 5 and 10, and placing sixth in the marathon. Ron Clarke ran all 3 events in 1964, and in 1968, Ethiopian Mamo Wolde and Kenyan Naftali Temu ran all 3 long-distance events, with Wolde winning gold in the marathon, and silver in the 10K, which was won by Temu, who also won a bronze in the 5K. Running both hurdles races – the 110 (or 100) and 400 hurdles – has been done only 4 times. It happened in 1928 and 1932, and the last 2 times it occurred was in 1964. In 1936 Jesse Owens won the 100, 200 and long jump, as did Carl Lewis in 1984. How often have people even competed in this sprinting-oriented triple? It has happened 21 times, with Lewis doing it in 1984 and 1988, and he was the last man. Several famous women did this – Irena Szewińska-Kirszenstein (POL) did it in 1968, Heide Drechsler-Daute (GDR) did it in 1988, and Marion Jones (USA) did it in 2000, unless she has been erased. At London in 2012 American Will Claye competed in the long jump and triple jump, as did Australian Henry Frayne. This is pretty common as this made 142 times this has been achieved at a single Olympics. Let’s not forget the big guys and gals, the weight throwers. Shot put and discus throw is a common double for the throwers to pull off. In fact, its been done 185 times at the Olympics, most notably by Soviet Tamara Press, who won both events in 1968, and in 1964 won the shot put and won silver in the discus. In 1906, Martin Sheridan also won both events – there, I got him in again. Have any throwers ever competed in more than 2 events? Of course they have – why else would I bring it up? Between 1900-24, 13 throwers competed 14 times in 3 or more of the weight throwing events (shot, discus, hammer, javelin). American Ralph Rose did it in 1904 and 1912, competing in the shot, discus, and hammer each time, winning a complete set of medals in all three events in 1904 – gold in shot put, silver in discus throw, and bronze in hammer throw. Perhaps most remarkably, in 1908 Britian Henry Leeke competed in all four throwing events, the only time this has been done at the Olympics. So this should answer pretty much any question you had about who has competed in the most track & field athletics events. So we’ve had a few e-mails recently concerning how common it is for athletes to compete in more than one Olympic Games. On the “Mike and Mike” ESPN radio show they speculated that it was actually quite rare for Olympians to compete in more than one Olympics. Thus we decided to look at this in some detail. Its not actually that rare and further, its becoming more and more common for athletes to compete in 2 or more Olympics. That is especially true of the Winter Olympics. We will only examine the Games since World War II, since the 12-year gap between 1936 and 1948 will skew all results, and this brings us closer to the modern era. So its fairly common to compete in more than one Olympics, although overall only about 30% of Olympians get to a second Games. 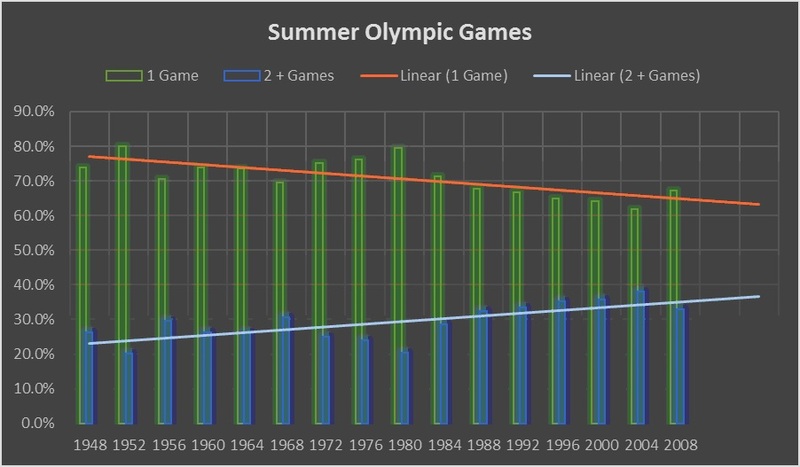 You’ll note, however, that Winter Olympians do it more frequently than summer Olympians – 34.1% to 25.7%. And women seem to come back to a second Olympics slightly more often than do men. Here are the lists of the Games since 1948, comparing athletes who started at each Olympics, and competed in either 1 or 2 or more (2+) Olympics. We stopped at 2008 and 2010, since anyone who first competed in 2012 or 2014 could only have competed at one Olympics as of February 2016. It is likely that the 2008 and 2010 numbers will eventually end up with a higher percentage for the 2+ Olympians, as some of those competing in 2008 and 2010 will likely compete in 2016 and 2018. 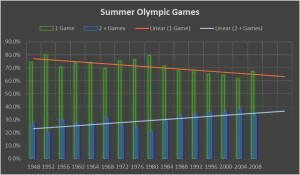 The numbers seem to be increasing and if we look at a graph and determine a best fit for the numbers, its fairly obvious that more and more athletes are competing in 2 or more Olympics. 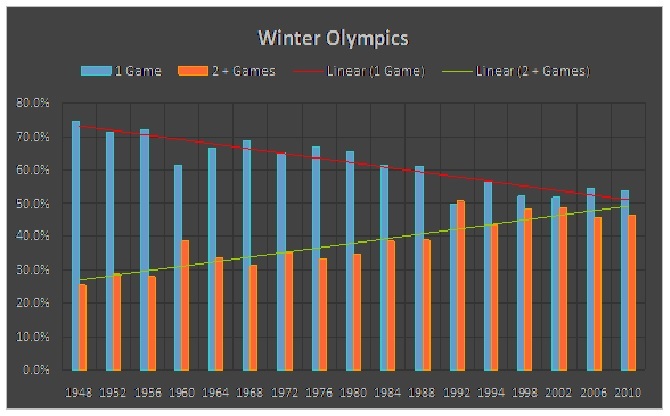 And here is the graph for the Winter Olympics, where there is now almost equilibrium between 1-time Olympians and those competing in 2 or more Games. 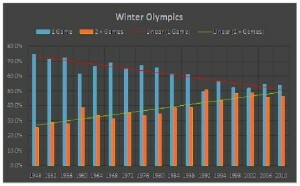 The biggest spike for the Winter Games occurs between 1992 and 1994, when the Winter Olympics had their only gap of 2 years between Games. What’s up with table tennis, where over 43% of the Olympians compete more than once? Further, fully 7.5% of Olympic table tennis players have competed in 4 or more Olympics, the highest total for any sport, and that approaches twice as much as equestrian (4.3%) and fencing (4.0%), the two next highest sports for that stat. Looking at Olympians competed in 6 or more Games, only equestrian and table tennis have any significant proportion of their Olympians achieving that, with equestrian leading table tennis – 1.1% to 0.8% – of Olympic table tennis players competing in at least 6 Olympics. Not too surprising is that luge sliders compete in more than one Winter Olympics more frequently than other Winter sport Olympians. But it is surprising that biathletes do so almost as frequently as lugers, and biathlon is a very physically rigorous sport. We really can’t explain that. So if you want to compete in more than one Olympics, pick your sport carefully, and realize you have a much better chance of doing this than your parents or grandparents did.